(Nanowerk News) The National Institute of Standards and Technology (NIST) has issued a new silver nanoparticle reference material to support researchers studying potential environmental, health and safety risks associated with the nanoparticles, which are being incorporated in a growing number of consumer and industrial products for their antimicrobial properties. The new NIST test material is believed to be the first of its kind to stabilize the highly reactive silver particles in a freeze-dried, polymer coated, nanoparticle cake for long-term storage. NIST's new silver nanoparticle reference material is designed for extended shelf life to support environmental health and safety studies. Nanoparticulate silver is a highly effective bactericide. It is, by some estimates, the most widely used nanomaterial in consumer products. These include socks and shoe liners (it combats foot odor), stain-resistant fabrics, coatings for handrails and keyboards, and a plethora of other applications. Silver nanoparticles are highly reactive. In the presence of oxygen or moisture they rapidly oxidize, subsequently releasing silver ions. This is the basis for their antimicrobial properties, but it also makes it difficult to create a standardized silver nanoparticle suspension with a long shelf life as a basis for doing comparative environmental studies. The new NIST product is the first to be stabilized by coating and freeze-drying—a technique commonly used in the pharmaceutical industry to preserve blood products and protein-based drugs. The NIST material uses polyvinylpyrrolidone (PVP), a polymer approved by the Food and Drug Administration for many uses, including as a food additive. The freeze-dried PVP-nanosilver cakes are flushed with an inert gas and sealed under a vacuum. Mixing the cake with water reconstitutes the original suspension. NIST reference materials are designed to be homogeneous and stable. NIST provides the best available estimates for key properties of reference materials. 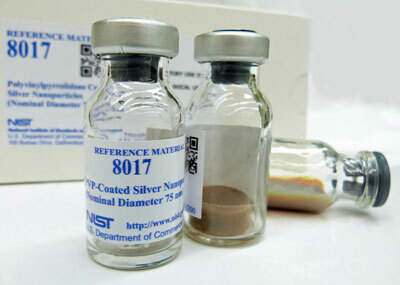 In this case those include the mean silver particle size measured by four different methods, the total silver mass per vial, and the percentage distribution of nanoparticle sizes. The particles have a nominal diameter of 75 nanometers. NIST expects the material to be stable indefinitely when properly stored and handled, but will continue to monitor it for substantive changes in the reported values.